If you open this file, you'll see some song automation. And, this was recorded into the sequencer with the pitch bend wheel of an M-Audio Oxygen. It wasn't sending MIDI pitch bend messages. It was sending MIDI CC 1. I can reassign the wheel on that particular controller, and a sprung wheel is good. Anything that sends CC 1 would do. And if you do that with, almost, all of these machines, then the pitch will bend, up and down, over a range of six semitones. This is the only machine that does anything in 'Song Mode'. Have a look at the machine in track 2. This is the template that everything is based on. The mixer in the, bottom, left corner is the 'Note CV accumulator'. There are a couple of machines here, where that has been unwired. Those ones don't bend. This mixer can be recalibrated for other ranges. It's good for, about, five semitones up and down. More than that, and MIDI starts to get a bit thin on the ground. 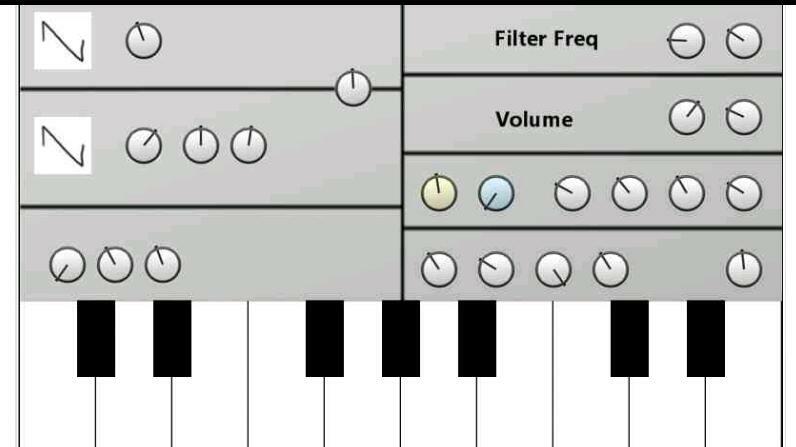 The synth, itself, could do plenty more than that. There are a series of simple templates in tracks 11-14. Just a couple of mixers. The names of the presets tell you how much bend you'll get. If you use the empty space to build a patch, and feed the output of the 3>1 mixer into the 'Note' input of any oscillators you use, then the pitch of those oscillators will increase by one octave. So, either tune them down, or transpose, and send in MIDI CC 1. Up, and down, the pitch will go. Job done. Press 'Record', wiggle controller. I won't go into a lot of detail about the other machines. You're, probably, familiar with the term 'subtractive synthesis'. You start with a rich palette of frequencies, and then, strip out the ones you don't need. The UMF in track 2 is like that with utilities. You start with a rich palette of functions and strip out the ones you don't need. So, use your eyes and ears a bit. The machines say what they do. I've kept extras to a minimum. Obviously, things have been rewired, here and there. Unused cables have been removed for clarity's sake. The oscilloscopes aren't eye candy. There's some song automation, just, to denote parameters that are worth playing with. If you can read this, and a road map and turn on a light switch, you'll be fine. We need to talk about control signals, sometime, but not now. Go and record some pitch bend into the sequencer.